As Hiʻiaka enters Kahuku she offers a very specific oli in order to gain permission to enter and acceptance of the people who live there. The oli entitled, He Kau Hula or He Pule No Hiʻiaka is the chant she offers upon her entrance. Kuluwaimaka, Mele Book, Bishop Museum Archives, Call Number BMHI.M.51.BK 2. See Appendix A.11 for original document. Where in the upland is the blessed pandanus alter? To you who is in there. Kuluwaimaka, Mele Manuscript Collection, Bishop Museum Archives, Call Number BMHI.M.51.BK1. Aliʻi who honor the Gods are looked upon with much respect. Here the aliʻi of Kahuku praise the Gods; Kāne, Kanaloa and Kū in the oli entitled, Ponaha Ka Manu I Luna. This song is found in the Hawaiian Language Newspaper; Ke Aloha ʻĀina. A o ia nei la ke aliʻi. Lo! Here is our chief. Love is a quality that is often remarked in song. This next mele speaks of love and the intimate qualities of an affair that occurs in or is tied to Kahuku. 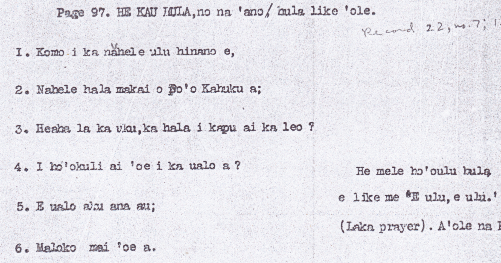 The song, entitled Aka Luna Hoi Au I Kahuku, is accessed through the Bishop Museum Archives within the Mele manuscript collection. Author unknown, Mele Manuscript Collecion, Bishop Museum Archives, Call Number HI.M.52. See Appendix A.13 for original document. Some mele spoke of the lands that you are from. The mele entitled, Aloha Ka Uka I Ke Onaona, is one example of this. A woman visiting the Waipahu area chanted this particular mele about her home in Kahuku. It is said that she accompanied this mele with the playing of a nose flute. Document original can be seen at the Bishop Museum. Hoopumehana i ka poli o ka mauka. Cared for in the arms of your mother. Ke ala hinano o Kahuku. The hala fragrance of Kahuku. George Pooloa, “Na Inoa o na Pana Kaulana o ka Mokupuni Oahu”, Ke Aloha ʻĀina, April 18, 1919. See Appendix A.14 for original document.